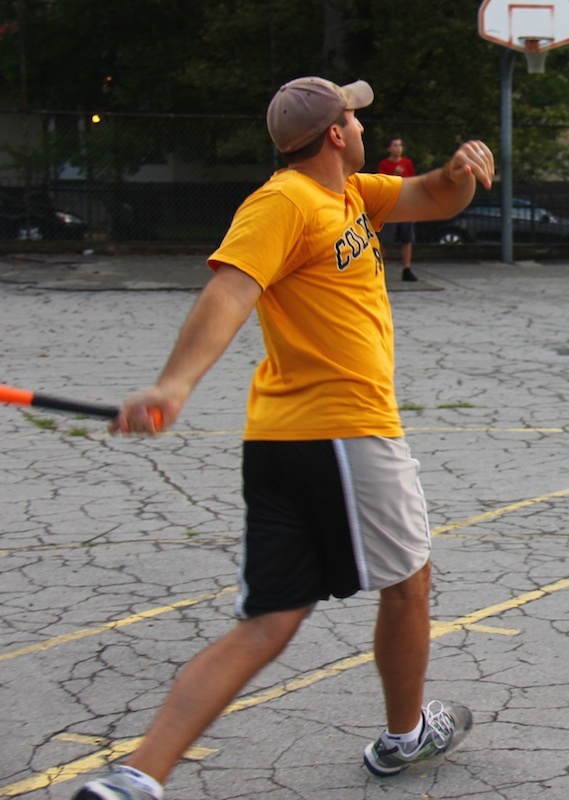 The Ham Slams went down swinging, but Questionable Outfit’s offense was ultimately too much as they won game 3 9-6, completing a three-game sweep and advancing to the 2013 EWL Wiffle Series. They await the conclusion of the other first round series between Eastbound & Dahn and Cookies & Cream, which will determine their opponent in the best-of-seven championship series. With Charlie out for the game, the Ham Slams put Josh on the mound. He got into trouble early, as Questionable Outfit took at early lead in the top of the first. Tom led off the inning with a single, and he moved to second when Reilly grounded out to left for the first out of the inning. Bob followed with a single off the fence, and Tom scored on the play to put Questionable Outfit ahead 1-0. With one-out and a runner on first, Mike blasted a two-run bomb to left, making the score 3-0. Tom followed with a single, but Josh ended the rally there, getting Reilly to ground out to left for the second out of the inning. Questionable Outfit put their ace, Bob, on the mound to close out the series. He retired the Ham Slams’ first batter, Kyle, who grounded out to right. Anthony followed with a one-out double, but Bob got Steve to fly out to center, stranding the runner and ending the inning. Questionable Outfit got right back to work in the top of the second, and added to their lead. Bob led off the inning with a solo shot to right, making the score 4-0. Mike followed with his second homer of the game game, and the back-to-back home runs pushed the Questionable Outfit lead to 5-0. Tom followed with a double, and Reilly drove him in with a two-run blast to left, pushing the score to 7-0. Josh finally registered an out when Bob grounded out to center, but the next batter, Mike, doubled. Tom followed with a double, driving in Mike, and the score was 8-0. The inning ended there, as Reilly flew out to right for the second out of the inning, but Questionable Outfit had opened up an eight-run lead. Josh led off the bottom of the second with a single, but as he was trying to advance to second for a double, he was caught in between bases for the first out of the inning. Bob then retired Kyle for the second out, ending the inning. Up 8-0, Bob added more of his own run support, leading off the inning with a solo homer to right. Josh avoided another big inning, retiring the next two batters, but Questionable Outfit was up nine. Anthony led off the bottom of the third with a single. Steve grounded out for the first out of the inning, and as Anthony was rounding from first to third, he overran third base and was tagged out by Bob, ending the inning. 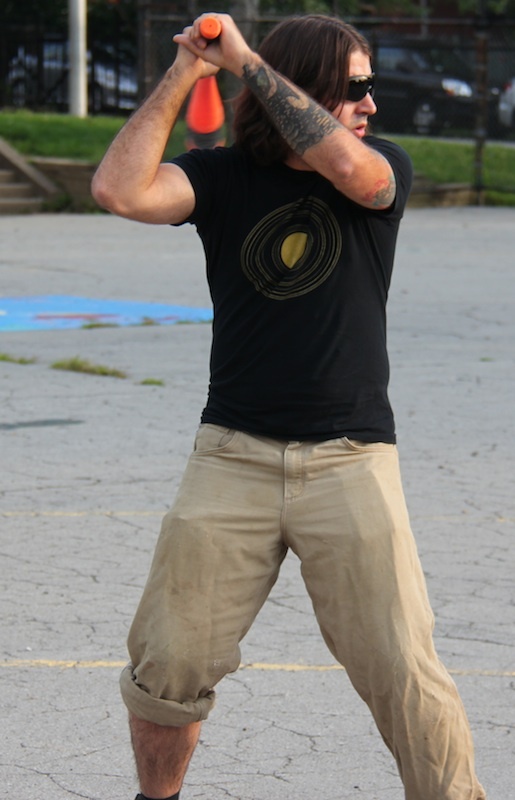 Josh finally pitched a perfect frame in the top of the fourth, retiring the Questionable Outfit side in order. Bob retired Josh to lead off the bottom of the fourth, but the Slams finally got on the board when Kyle hit a one-out solo homer, making the score 9-1. The Ham Slams couldn’t extend the inning, as Bob retired Anthony to end the inning. Josh pitched his second consecutive scoreless inning in the top of the fifth, retiring Mike and Tom consecutively. The Ham Slams showed signs of life in the bottom of the fifth, and their fifth inning rally made the game interesting. Steve led off the inning with a single, and the next batter, Josh, hit a two-run homer through the tree in left, making the score 9-3. Kyle followed with a single, and after Anthony flew out to the mound for the first out of the inning, Steve crushed a two-run home run, cutting the deficit to 9-5. Josh followed with a single, but the rally ended there, as Bob retired Kyle to end the inning. Josh retired Reilly to lead off the top of the sixth, and after Bob hit a one-out single, Mike grounded out to right to end the inning. 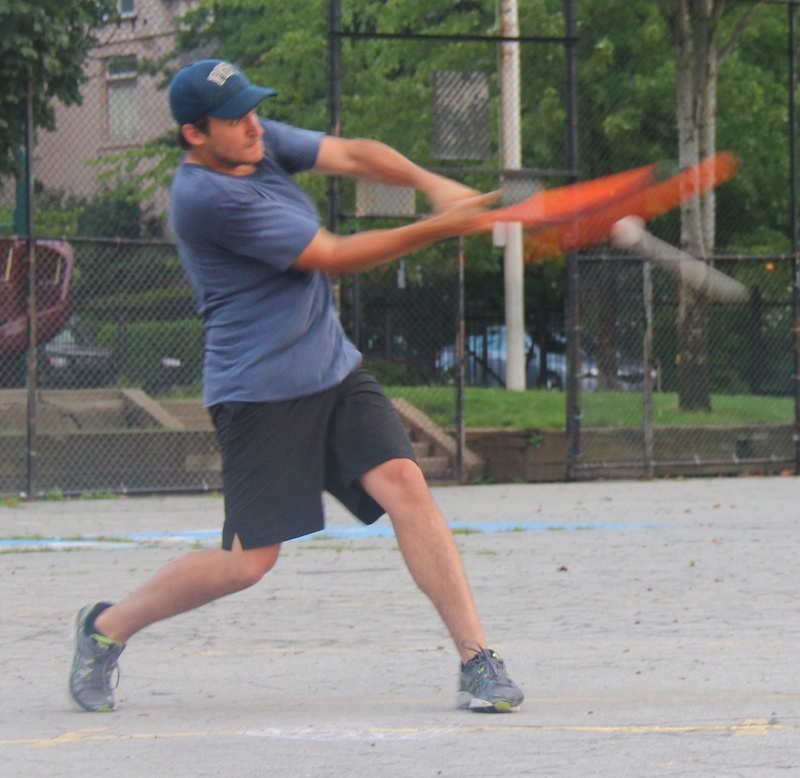 Trailing 9-5, the Ham Slams would need a four-run inning to extend the game and their season. Anthony led off the inning with a solo homer, cutting the score to 9-6. Steve flew out to right for the first out of the inning, but Josh followed with a one-out single. It looked as if the Ham Slams would rally, but Bob got Kyle to ground out to right for the second out, ending the game. Questionable Outfit’s 9-6 win clinched a three-game sweep of the Ham Slams, and earned the squad a berth in the 2013 EWL Wiffle Series. 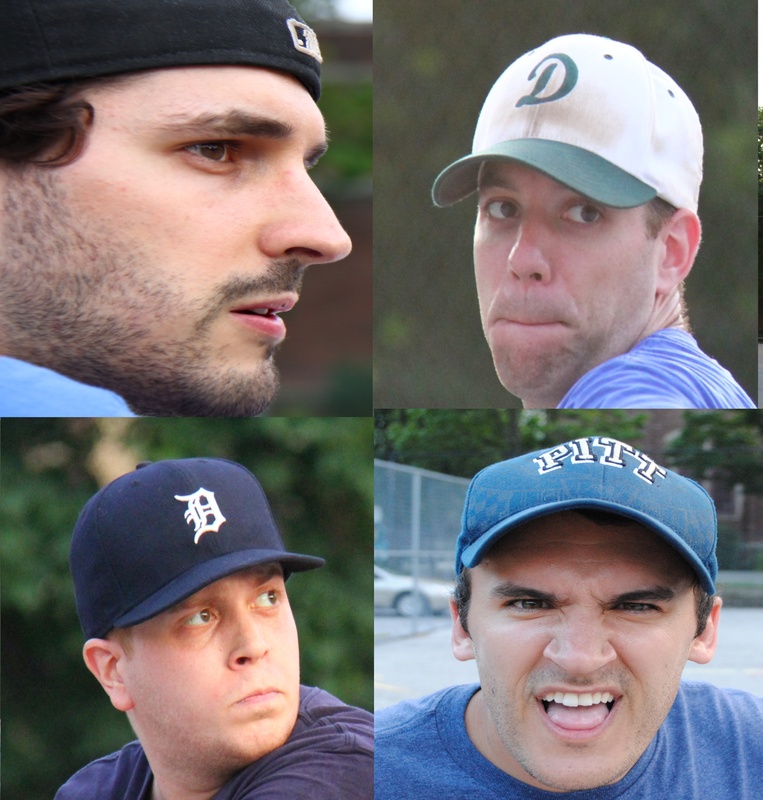 The Ham Slams were eliminated in the first round of the playoffs for the second consecutive year. – Bob pitched the complete game win for Questionable Outfit. He allowed 6 runs on 11 hits in 6 innings. 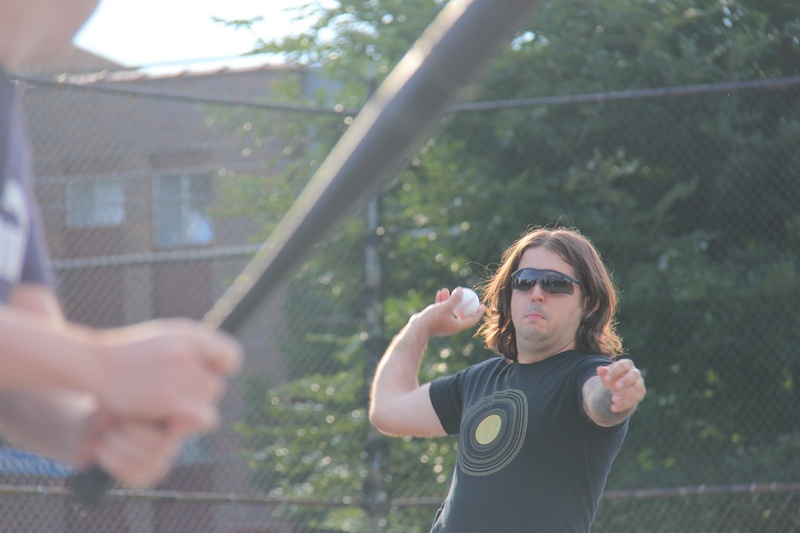 – Josh took the loss for the Ham Slams, giving up 9 earned runs on 12 hits in 6 innings pitched. 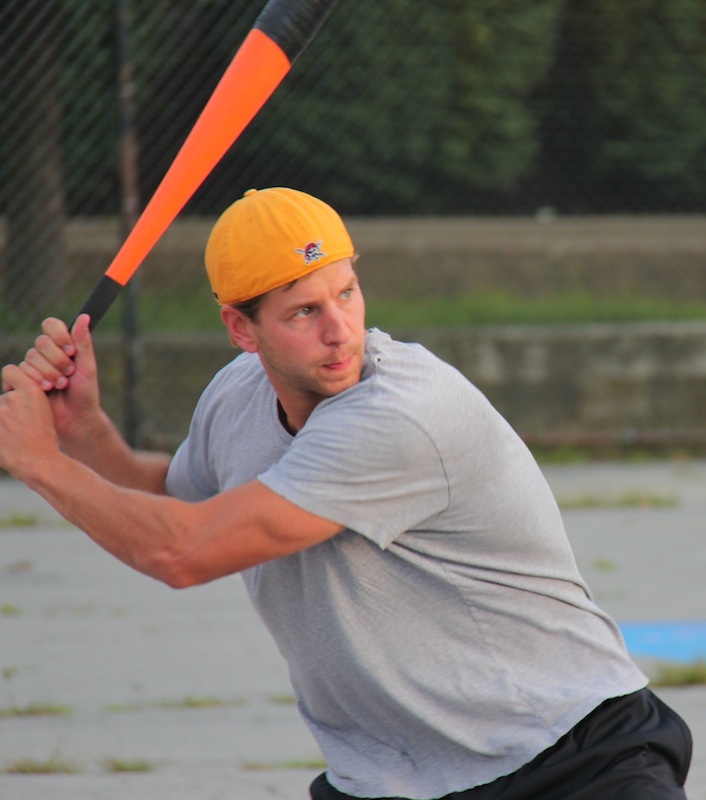 – Bob led Questionable Outfit on offense, going 4-for-6 with 2 singles, 2 homers, 3 runs scored, and 3 RBI. 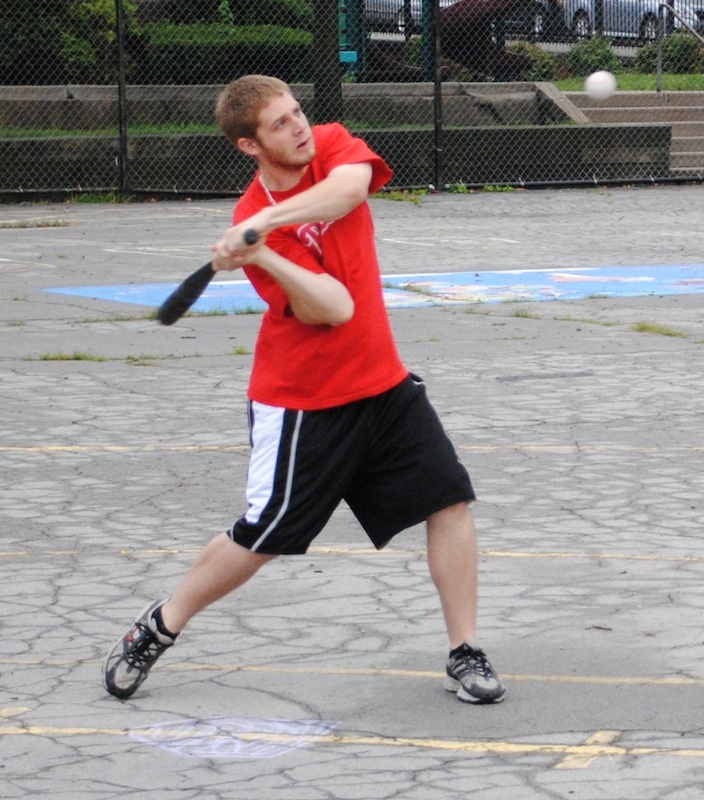 Mike also had 3 hits, including 2 homers and 3 RBI, and Tom had 4 hits. – Josh led the Ham Slams at the plate, going 4-for-5 with 3 singles, a home run, a run scored, and 2 RBI. Kyle, Anthony, and Steve also homered in the game. 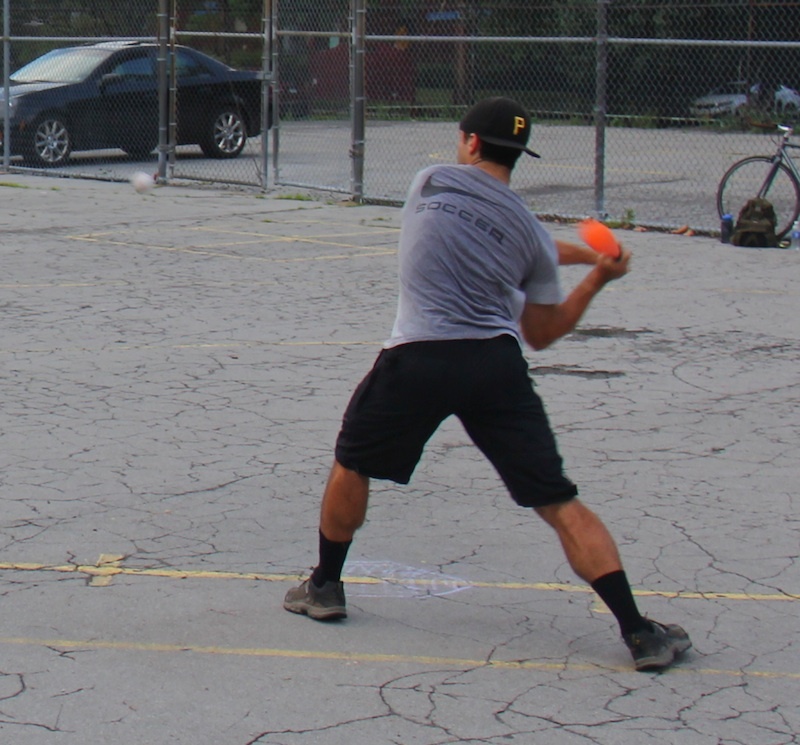 – Questionable Outfit will advance to the wiffle series in their first season in the EWL, becoming the first team since the league’s original season to make the wiffle series in their first year as a franchise. In one of the most exciting games in the history of the EWL playoffs, Dinger’s walk-off solo homer in the bottom of the 8th gave Cookies & Cream a 10-9 victory and two-game lead in their best-of-five series with Eastbound & Dahn. Dinger started on the mound for Cookies & Cream, and he got off to a good start in the top of the first, retiring Eastbound & Dahn in order. Mark would start the game for Eastbound, and he matched Dinger in the bottom of the second, retiring Guthrie and Morrison consecutively. Dinger continued to pitch well in the top of the second. He retired Ivan for the first out, and after Mark singled, retired Helal to end the inning, stranding the runner. Mark matched Dinger again, pitching a scoreless bottom half of the inning. Eastbound would break the scoreless tie in the top of the third. After Ivan grounded out for the first out of the inning, Mark hit a solo bomb to right, putting Eastbound & Dahn ahead 1-0. Dinger retired the next batter, Helal, to end the inning. Cookies & Cream would return the favor in the bottom of the third. After retiring Guthrie for the first out, Mark gave up a solo shot to Morrison, tying the game at 1-1. He then retired Joey to end the inning. With the game tied at 1-1, Ivan led off the top of the fourth with a solo homer to deep right field, and Eastbound had regained the lead at 2-1. Mark followed with a double, and it looked as if Eastbound would rally. The next batter, Helal, ripped a line drive to left-center, but the ball hit Mark in the air as he was advancing from second to third, making him out in between bases. Helal was safe at first, but Eastbound couldn’t capitalize, as Dinger retired Ivan for the second out of the inning. Dinger led off the bottom of the fourth with a single, and he moved to second when Guthrie followed with a single. The next batter, Morrison, hit another single, but on the play Dinger overran third base and was tagged out for the first out of the inning. With one out and two runners on, Mark retired Joey, stranding both runners and maintaining the 2-1 lead. Eastbound got out their bats and opened up a big lead in the top of the fifth. Mark led off the inning with a solo shot, his second of the game, making the score 3-1. Helal followed with a single, and he moved to second when Ivan singled. Mark would hit another single, and Eastbound had loaded the bases with no outs. The next batter, Helal, stepped to the plate and crushed a deep fly to right-center. 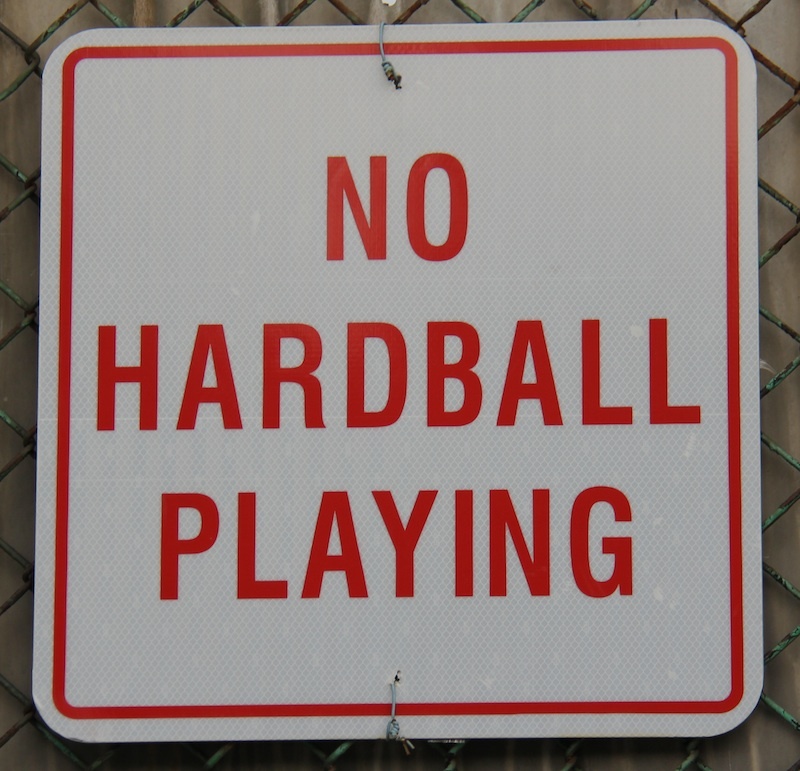 The ball cleared the fence, and Helal had hit only the second grand slam in the history of the EWL playoffs. The blast put Eastbound ahead 7-1 and they appeared to be in cruise control. Dinger retired the next batter, Ivan, and after Mark hit a one-out single, his third hit of the inning, Helal flew out to the mound to end the inning. Down six runs, Cookies & Cream bounced back in the bottom of the fifth. Dinger led off the inning with a single, and moved from first to third when Guthrie followed with a double. With no outs and two runners in scoring position, Morrison hit a three-run bomb to left, his second homer of the game, cutting the Cookies & Cream deficit to 7-4. Mark retired Joey for the first out of the inning, but the next batter, Dinger, hit a solo shot, cutting the score to 7-5. Guthrie then grounded out for the second out of the inning, but Cookies & Cream had put a dent in the deficit. 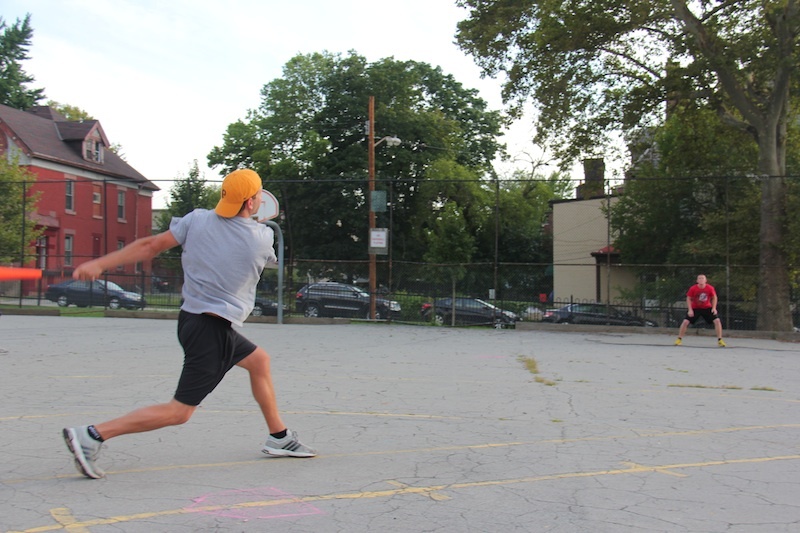 With the score 7-5, Ivan led off the top of the sixth with a solo home run, and Eastbound & Dahn had taken an 8-5 lead. The next batter, Mark, hit another solo bomb, his third of the game, and the back-to-back jacks made the score 9-5. Dinger retired the next two batters, but Cookies & Cream, after rallying back within two runs, would head into their final at-bat down four. Down 9-5, Morrison, who had been red hot all day, led off the bottom of the sixth with a solo shot, his third home run of the game. The blast cut the score to 9-6. Mark retired the next batter, Joey, and Cookies & Cream trailed by three runs and were down to their final out. Dinger, who had reached base safely in his previous three at-bats, hit a low-flying solo home run over the left field fence, making the score 9-7. The next batter, Guthrie, singled, and the tying run, Morrison, was at the plate. He hit a laser to left-center, and Guthrie raced around to score on the play. As Morrison attempted to extend a double into a triple, Eastbound & Dahn tried to peg him with the ball. The ball missed and went flying, and Morrison frantically scrambled around the bases. He crossed home plate, and his two-run inside-the-park home run had miraculously tied the game at 9-9. Joey followed with a one-out double, and Cookies & Cream had the winning run in scoring position. Dinger came to the plate scorching, but Mark buckled down, getting him to fly out to center for the second out of the inning. The game would go on, but Cookies & Cream had rallied from 4 runs down in their final at-bat, scoring 3 of the runs with one out, to tie the game and send it to extra innings. Cookies & Cream removed Dinger from the game and turned to their ace, Guthrie who had two innings of pitching eligibility remaining for the game. He retired Mark and Helal in order in the top of the seventh, and the game remained tied at 9-9. Mark stayed in the game for Eastbound, and he made history in the bottom of the seventh. After retiring Guthrie for the first out of the inning, Mark intentionally walked Morrison, the first intentional walk in the history of the EWL. The little mentioned rule had never been used, but after Morrison had hit four home runs in the game, he seemed as ideal a candidate as any player. The next batter, Joey, could not make Eastbound pay for the first intentional walk. He flew out to deep center, extending the game. Guthrie remained in control in the top of the eighth, retiring the side in order. With the score tied at 9-9, Dinger led off the bottom of the eighth inning. He blasted a deep fly over the left-field fence, and the solo shot, his third of the game, would serve as a walk-off homer for Cookies & Cream. For the second consecutive game, Cookies & Cream had come from behind to win on a walk-off homer. The 10-9 victory gave Cookies & Cream a 2-0 lead in their best-of-five series with Eastbound & Dahn, one win away from advancing. – Dinger pitched 6 innings for Cookies & Cream, allowing 9 runs on 13 hits. Guthrie relieved him, pitching 2 innings while allowing no runs and no hits, earning the win. – Mark pitched the complete game loss for Eastbound, giving up 10 runs on 14 hits in 7 innings. – Morrison had a historic performance at the plate for Cookies & Cream. He went 5-for-6 with a single, 4 home runs, 4 runs scored, 7 RBI, and became the first player in the history of the league to be intentionally walked. – Dinger also had an epic game, going 5-for-7 with 2 singles, 3 home runs, 4 runs scored, and 3 RBI. His walk-off homer won the game. – Mark led Eastbound & Dahn at the plate, going 7-for-10 with 3 singles, a double, 3 homers, 4 runs scored, and 3 RBI. – Helal became only the second player in the history of the EWL playoffs to hit a grand slam. He drove himself in on the play. Morrison homered twice, including game-tying and game-winning home runs, as Cookies & Cream came from behind to take game 1 of their first round series against Eastbound & Dahn. Cookies & Cream sent staff ace Guthrie to the mound to face Eastbound & Dahn, who were depleted and playing with only 3 players. Guthrie started well, retiring the side in order in the top of the first. 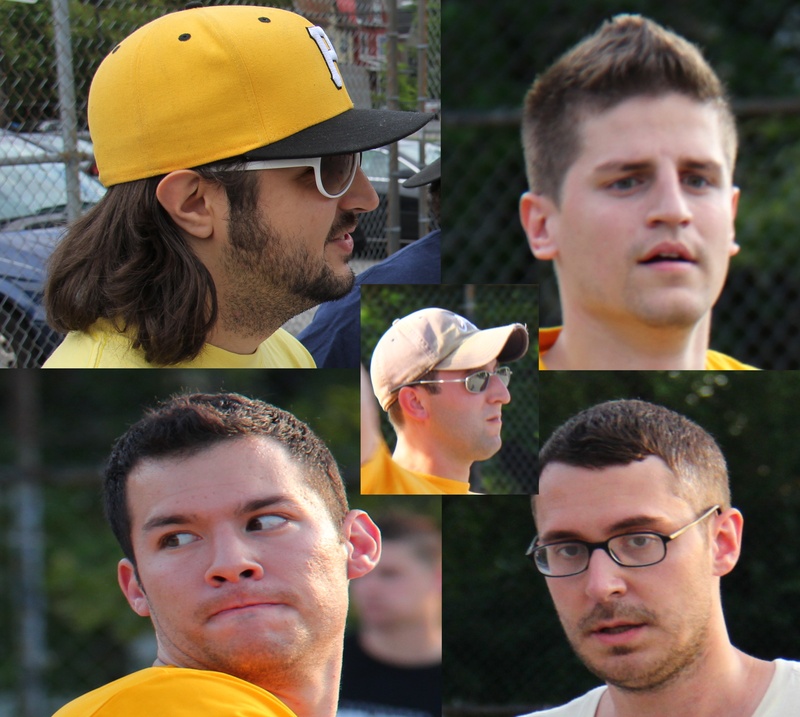 Eastbound & Dahn started Helal, their best pitcher during the 2013 season, and also started hot. He send Dinger and Guthrie down consecutively in the bottom of the first. Guthrie would find himself in some trouble in the top of the second, starting when Ivan led off the inning with a double. The next batter, Mark, ripped an RBI single off the fence, putting Eastbound & Dahn ahead 1-0. Mark moved from first to third when Helal, the next batter, grounded out to right. But Guthrie buckled down, retiring Ivan to end the inning, stranding the runner at third. Helal rolled through the bottom of the second, retiring the side in order. Eastbound would add to their lead in the top of the third. Mark led off the inning with a single. After Helal flew out for the first out of the inning, Ivan roped a double to right-center, scoring Mark and putting Eastbound & Dahn ahead 2-0. Guthrie escaped further damage, retiring Mark for the second out of the inning. Helal continued to pitch in command in the bottom of the third. Dinger flew out to right for the first out, and after Guthrie hit a one-out double, Helal stranded him, retiring Joey for the second out of the inning. Guthrie got back on track in the top of the fourth, retiring the side in order. Morrison led off the bottom of the fourth with a single, but Helal stranded him, retiring the next two batters to end the inning and preserve the 2-0 lead. Guthrie settled into a groove in the top of the fifth, sending Mark and Helal down consecutively. Down 2-0, Cookies & Cream finally cracked Helal in the bottom of the fifth. Joey led off the inning with a single, and the next batter, Morrison, ripped a two-run homer to deep left-center, tying the game at 2-2. Dinger followed with a single, and it looked as if Cookies & Cream were about to explode, but Helal settled down, retiring Guthrie and Joey to end the inning. With the game tied at 2-2, Eastbound & Dahn were unable to regain the lead in the top of the sixth. Guthrie retired his sixth and seventh consecutive batters for a perfect frame, taking the game to the bottom of the sixth. After taking 5 innings to score a run, Cookies & Cream had tied the game in the fifth, and would end it in the sixth. The first batter, Morrison, blasted a solo shot to left, and his walk-off homer gave Cookies & Cream a 3-2 game 1 victory. 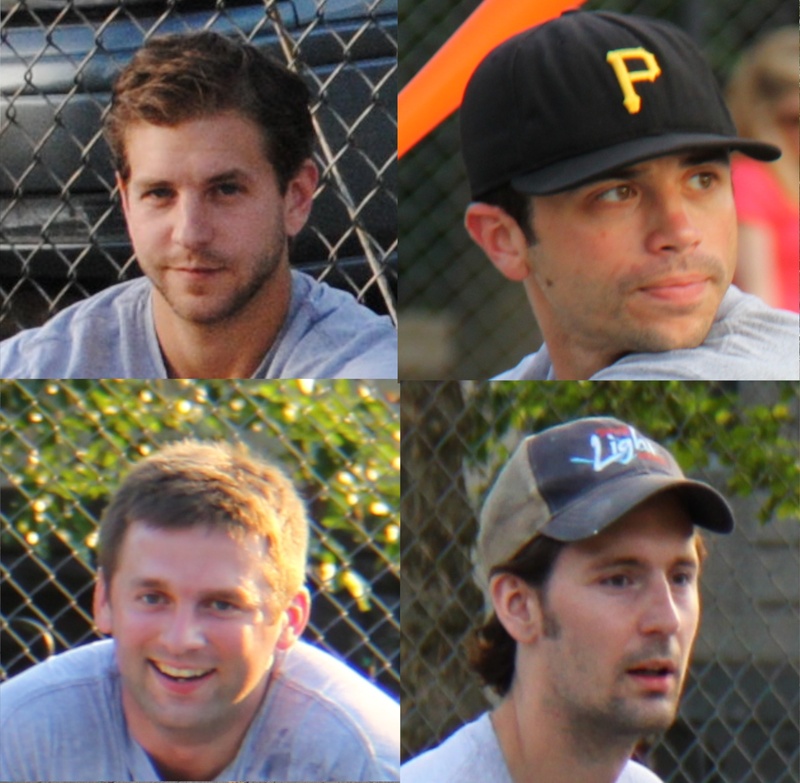 The win pulled Cookies & Cream into a 1-0 lead in their best-of-five first round series with Eastbound & Dahn. – Guthrie pitched the complete game win for Cookies & Cream, allowing 2 earned runs on 4 hits in 6 innings pitched. – Helal took the loss for Eastbound & Dahn, giving up 3 runs on 6 hits in 5 innings. – Morrison led Cookies & Cream in the win, going 3-for-4 with a single, 2 home runs, 2 runs scored, and 3 RBI. 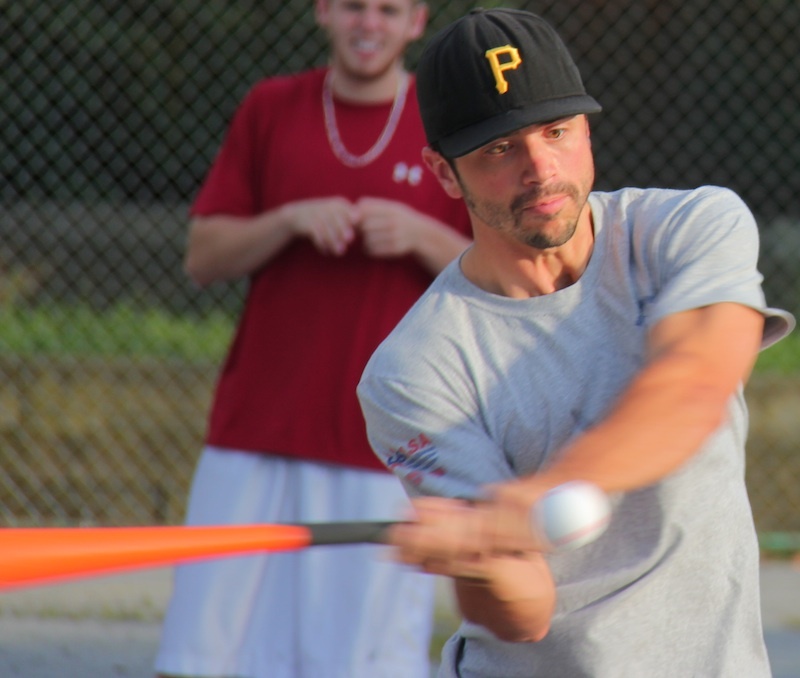 – Ivan led Eastbound & Dahn at the plate, going 2-for-5 with 2 doubles, a run scored, and an RBI. Mark also had 2 hits and an RBI for Eastbound. 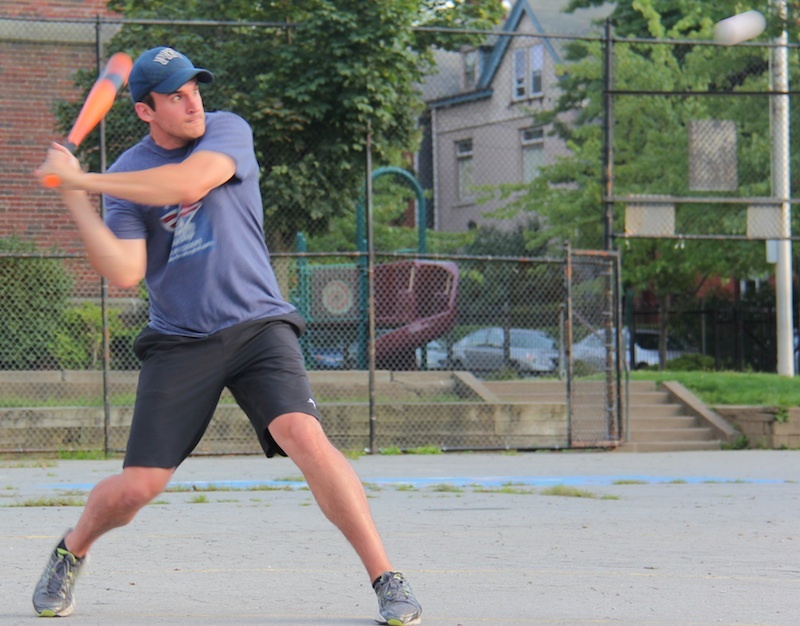 Despite only tallying 4 hits in 7 innings, Questionable Outfit escaped game 1 with a win over the Ham Slams thanks to Kimble’s 3 solo homers which put Questionable on the board in the fourth, tied the game in the sixth, and won the game in the seventh. 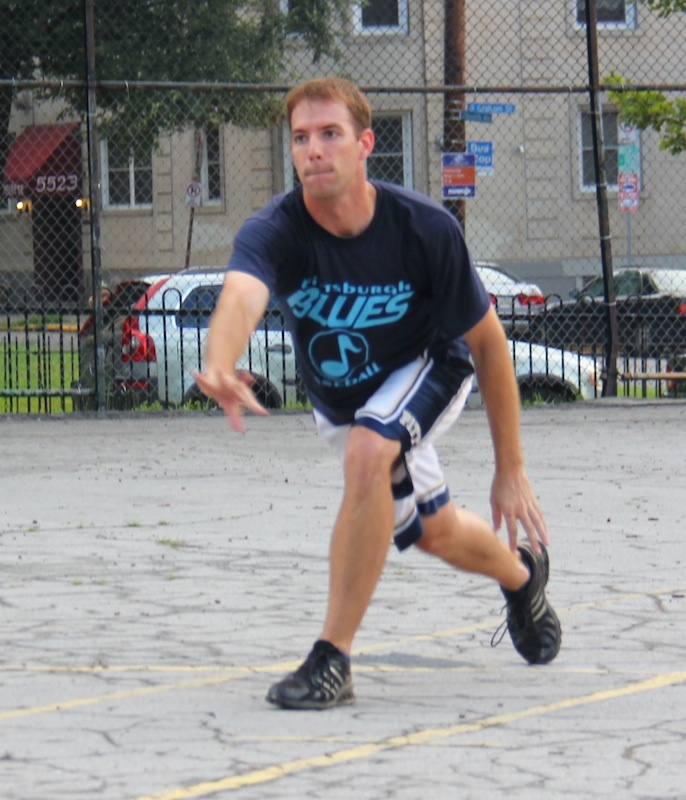 Questionable Outfit’s ace Bob started the first playoff game of the 2013 season, and he and the #1 seed got into trouble early. Kyle led off the game for the Ham Slams with a single, and moved to third when Anthony followed with a double. The Ham Slams were threatening early, with two runners in scoring position and no outs. The next batter, Steve, flew out to shallow right, and no runners were able to advance on the play. But the next batter, Josh, hit a hard single to right, scoring Kyle to put the Ham Slams up 1-0. The Slams had runners on the corners with one out, but Bob struck out Charlie for the second out, ending the inning and stranding two. 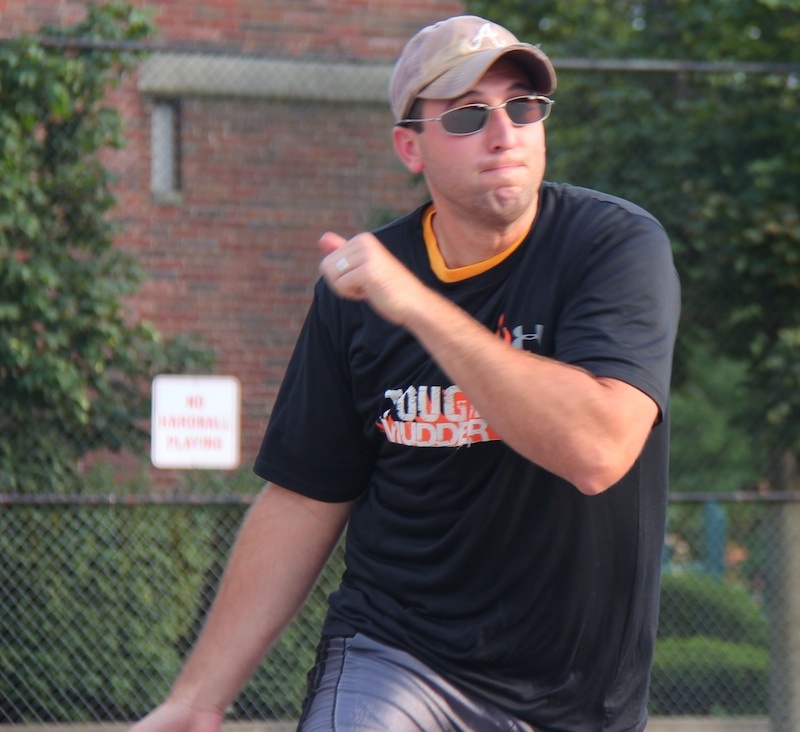 The Ham Slams started their ace, Charlie, and he got off to a more favorable start. He retired Tom for the first out, and after Reilly hit a one-out single, Bob flew out to left for the second out of the inning. Bob had an easier top of the second, starting by retiring Kyle for the first out of the inning. Anthony hit a one-out single, but was stranded when Bob retired Steve to end the inning. Charlie cruised through the bottom of the second, retiring Questionable Outfit in order. Bob pitched a perfect frame in the top of the third, sending down Josh and Charlie consecutively. Charlie matched Bob in the bottom of the third, retiring the side without a hit. Bob continued to roll in the top of the fourth, pitching a scoreless inning. Questionable Outfit, the league’s most prolific offense, would finally get on the board in the bottom of the fourth. Charlie retired Mike for the first out of the inning, but the next batter, Tom, crushed a solo bomb to deep left, tying the game at 1-1. Charlie minimized the damage, retiring Reilly to end the inning. The Ham Slams took the lead right back in the top of the fifth. Bob retired Steve for the first out, Josh followed with a solo homer to left-center, putting the Ham Slams back ahead 2-1. Bob fanned Charlie for the second out of the inning, but Questionable Outfit would trail again. Charlie held two of the league’s best hitters, Bob and Mike, in check in the bottom of the fifth, retiring the side in order, preserving the Ham Slams lead. The Slams were unable to add to their lead in the top of the sixth, as Bob retired the side consecutively. Questionable Outfit would head into their last at-bat in game 1 trailing the Ham Slams 2-1. They had only managed two hits in the first five innings, and were two outs away from a stunning loss to start their postseason. The first batter of the inning, Tom, who had one of their two hits, launched a deep fly ball to left, clearing the fence and tying the game at 2-2. Despite trailing nearly the entire game, Questionable Outfit was one run away from stealing game 1. But Charlie buckled down and retired Reilly and Bob to end the sixth, sending the game to extra innings. Bob remained in the game, and he retired Steve for the first out in the top of the seventh. The next batter, Josh, hit a one-out single, putting the go-ahead runner on base. But Bob retired Charlie for the second out, ending the inning. With the score tied at 2-2, Charlie retired Mike for the first out in the bottom of the seventh. The next batter, Tom, had homered in his previous two at-bats. Remarkably, with one out, he destroyed a pitch over the left field fence, and his walk-off solo homer gave Questionable Outfit an incredible 3-2 win in game 1. 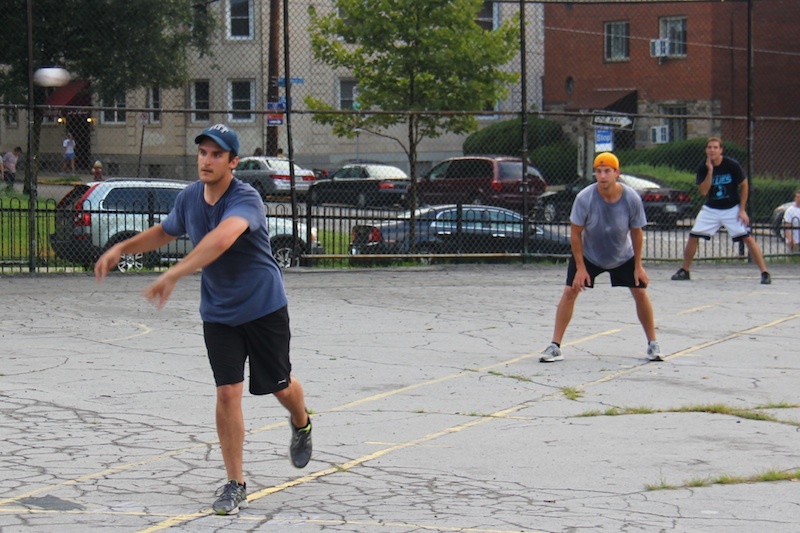 The win put Questionable Outfit ahead 1-0 in the best of 5 first round series against the Ham Slams. – Bob picked up the win for Questionable Outfit, going 7 innings while allowing 2 earned runs on 6 hits and striking out 2. 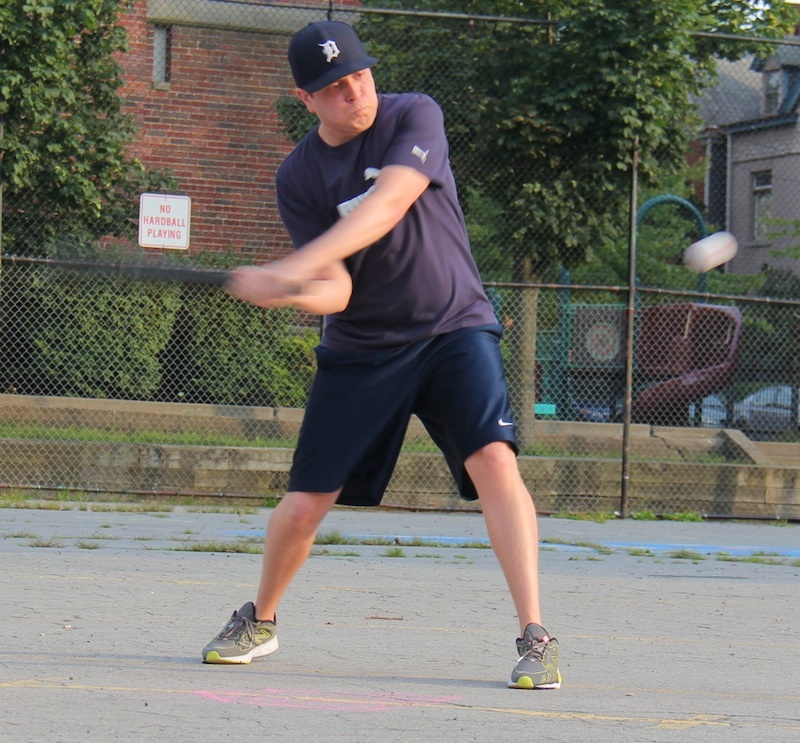 – Charlie took the loss for the Ham Slams, allowing 3 runs on 4 hits in 7 innings. 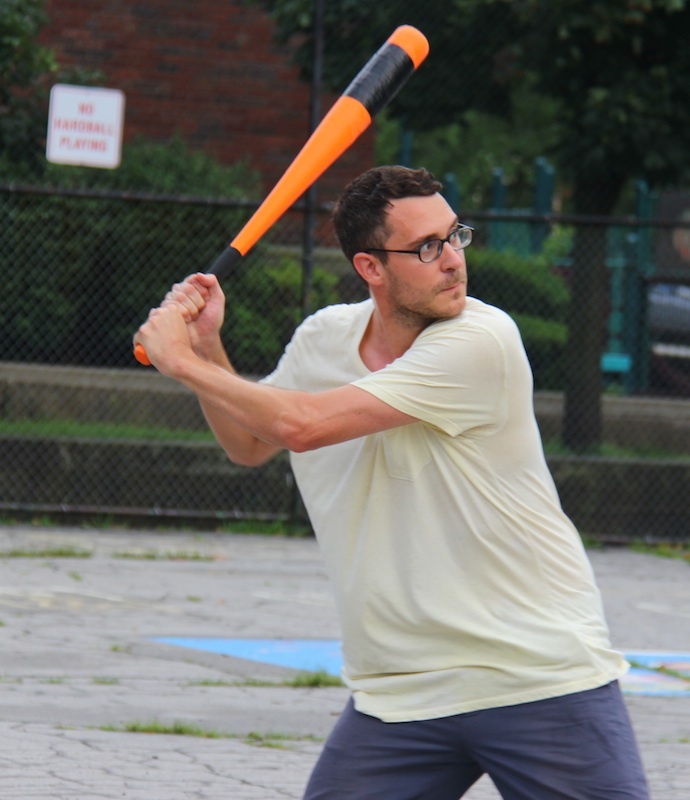 – Tom led the way for Questionable Outfit at the plate, going 3-for-5 with 3 homers, 3 runs scored, and 3 RBI. The only other Questionable Outfit player to register a hit was Reilly, who singled. – Josh led the Ham Slams on offense, going 3-for-4 with 2 singles, a home run, a run scored, and 2 RBI. After 10+ weeks and 20 games, the 2013 EWL regular season has come to a close. 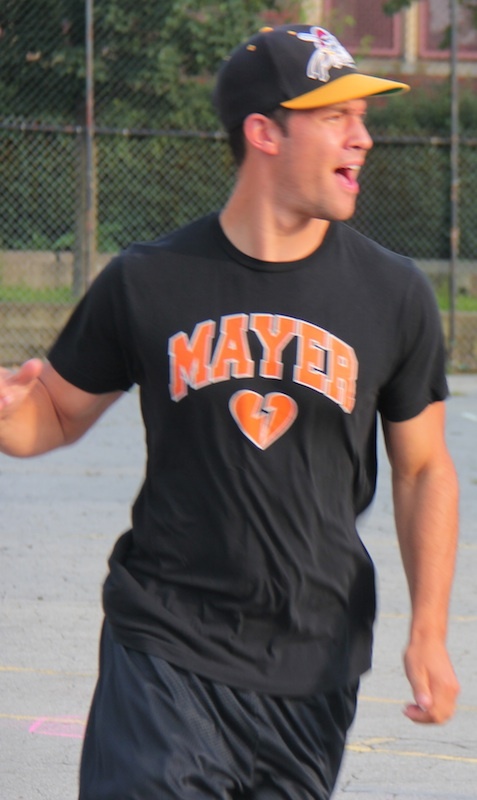 Questionable Outfit, a team full of rookies who started the season 0-2, got into a groove midseason and finished 13-7. Their regular season dominance of Cookies & Cream, who also finished 13-7, earned them the tiebreaker and, in their first season as a franchise, the 2013 pennant. As the #1 seed, they will face the Ham Slams, who struggled throughout the season, but started to show signs of improvement toward the end of the regular season. 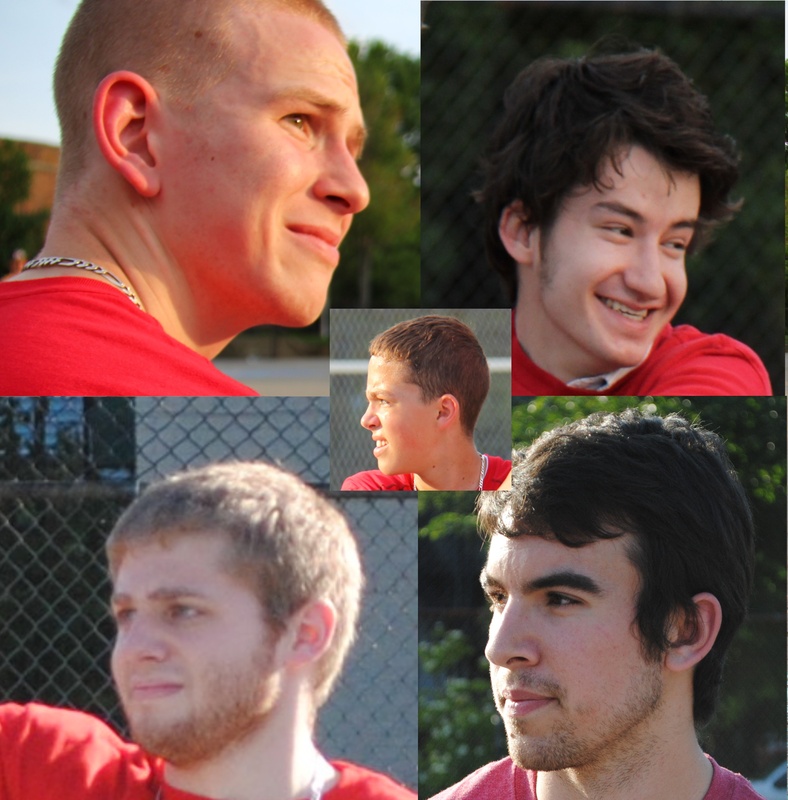 Cookies & Cream will face #3 seed Eastbound & Dahn, who were at times dominant and other times dormant. The first round best-of-five series start this week. 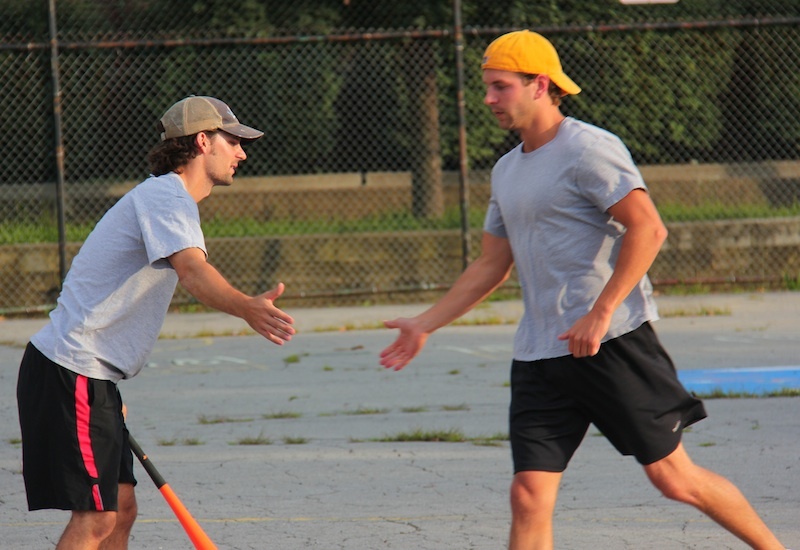 The Ham Slams hammered Helal in one of their best offensive showings of the season, and then barely held off a late Eastbound & Dahn rally to pick up an 8-6 win. Helal, who had pitched a complete game shutout in his last start against Ham Slams, got off to a disastrous start in this outing. Kyle led off the game with a deep solo homer to right field, making the score 1-0. Steve then followed with a solo shot of his own, extending the lead to 2-0. The next batter, Josh, crushed a monster solo bomb to left-center, and the back-to-back-to-back homers put the Ham Slams ahead 3-0. Helal finally regained control, retiring Charlie and Kyle to end the inning. Things got worse for Helal in the top of the first, when Charlie struck him out to start the game for the first out of the inning. Mark, however, followed with a solo bomb to deep right-center, cutting the score to 3-1. Eastbound & Dahn couldn’t rally though, as Charlie retired Trevar to end the inning. The top of the second went better for Helal, as he retired Steve to start the inning. Josh singled, but was stranded at first when Charlie grounded out to the mound for the second out. Charlie struck out Jason to start the bottom of the second, but got into some trouble with one out. Helal doubled, and the next batter, Mark, ripped a two-run homer to right, his second of the game. The home run tied the game at 3-3. Charlie then retired Trevar for the second out, ending the inning. The Ham Slams bounced right back in the top of the third. Kyle led off the inning with a solo homer, his second of the game, putting the Slams ahead 4-3. Steve followed with a triple, and scored when Josh grounded out to left for the first out of the inning. Helal struck out Charlie for the second out of the inning, but the Hams had regained a two-run lead. Charlie then breezed through the bottom of the third, retiring the side in order. Up two, the Ham Slams got back to work in the top of the fourth. Kyle singled, and moved to second when Steve followed with a single. The next batter, Josh, hit a three-run homer through the tree in left, putting the Ham Slams ahead 8-3. Helal retired the next two batters to end the inning, but the deficit was now five runs. 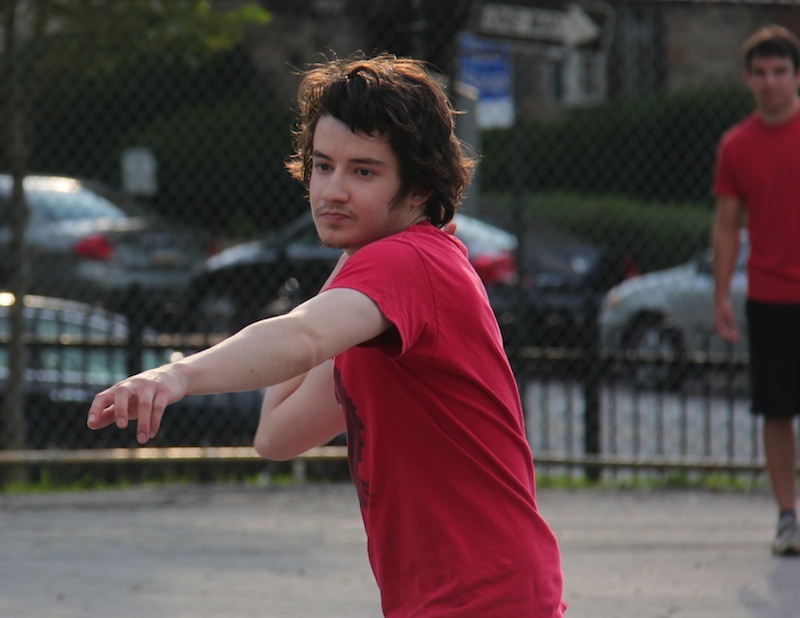 Charlie had reached his innings limit for the week, so the Ham Slams turned to their bullpen, placing Josh on the mound. 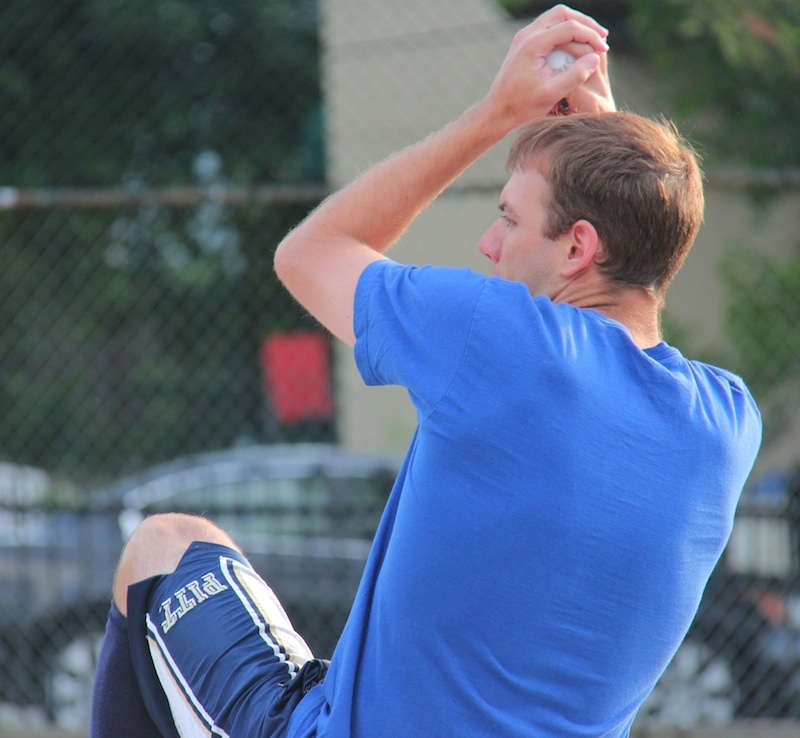 He pitched a perfect frame in the bottom of the fourth, maintaining the Ham Slams lead. Steve flew out to the mound for the first out of the inning in the top of the fifth, but Josh followed with a one-out triple. The Ham Slams couldn’t add to their lead, however, as Helal struck out Charlie to end the inning, stranding the runner at third. Eastbound & Dahn rallied in the bottom of the fifth, pulling closer to the Ham Slams. Jason led off the inning with a single, and Helal followed with a monster home run to deep center, making the score 8-5. After Mark flew out for the first out of the inning, Trevar hit a triple off the fence. The next batter, Jason, singled, scoring Trevar from third and cutting the deficit to 8-6. But the rally would end there, as Helal flew out to left for the second out, stranding the runner on first. Helal retired the side consecutively in the top of the sixth, and Eastbound would need two runs in the bottom of the sixth to tie the game. Mark led off the game with a single, and moved from first to third when Trevar followed with a single. The tying run was on first, and Jason came to the plate with no outs. He hit a ground ball to center, fielded by Steve for the first out. Steve then pegged Trevar, trying to advance to second, for the second out, ending the game and giving the Ham Slams an 8-6 win. 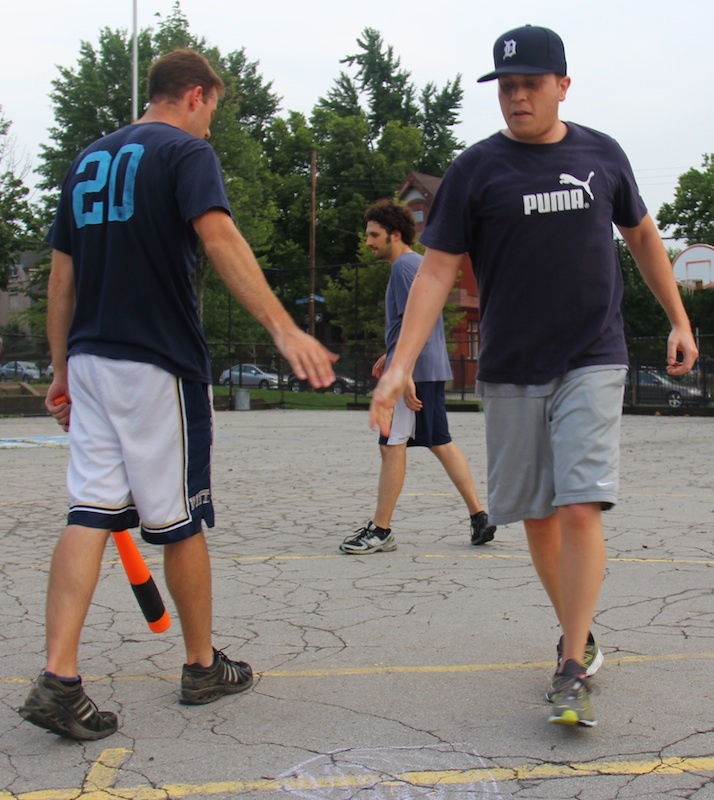 The win moved the Ham Slams to 6-13 on the year, while the loss dropped Eastbound & Dahn to 8-12. They will head into the playoffs on a three-game losing streak. – Charlie pitched three innings for the Ham Slams, picking up the win. He 3 runs on 3 hits while striking out 2. Josh also pitched three innings for the Slams, allowing 3 runs on 6 hits. – Helal took the loss for Eastbound & Dahn. He surrendered 8 runs on 10 hits and struck out 2 batters. – Josh led the Ham Slams at the plate, going 4-for-5 with a single, a triple, 2 home runs, 2 runs scored, and 5 RBI. 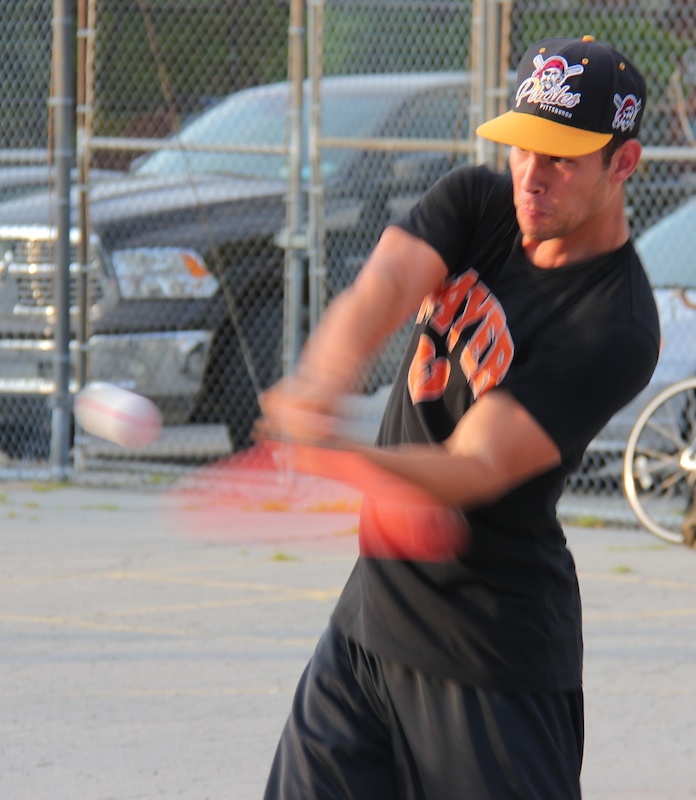 – Steve and Kyle also each had 3 hits for the Ham Slams. – Mark led Eastbound & Dahn offensive, going 3-for-5 with a single, 2 homers, 2 runs scored, and 3 RBI. In a game that went back and forth, Questionable Outfit went up early, lost their lead, and narrowly missed tying the game late in a 4-3 loss to Cookies & Cream. Guthrie made his second consecutive start for Coookies & Cream, and it looked like things would get dicey early. Tom led off the game with a single, and moved to second when Reilly grounded out for the first out of the inning. The next batter, Reilly Jr. launched a two-run homer into left-center, putting Questionable Outfit ahead 2-0. Guthrie then retired Tom to end the inning, avoiding further damage. Reilly Jr. made his first career pitching appearance, starting on the mound for Questionable Outfit. He retired Dinger for the first out of the inning, and after Guthrie doubled with one out, Joey grounded out to the mound for the second out of the inning, stranding the runner. Guthrie pitched a perfect frame in the top of the second, and it looked as if Cookies & Cream would rally in the bottom of the second. Morrison led off the inning with a single, and moved to second when Dinger singled. Guthrie flew out to the mound for the first out of the inning, but Joey followed with a single, loading the bases for Morrison with one out. He had been on a tear coming into this at-bat, but Reilly Jr. buckled down and got him to fly out to left for the second out of the inning, stranding all three runners on base. Guthrie cruised in the top of the third, retiring the side in order. Cookies & Cream finally got on the board in the bottom of the third when Dinger led off the inning with a low-flying liner that topped the left field wall. His solo shot cut the score to 2-1. Guthrie followed with a triple, and the next batter, Joey, hit a deep fly to left. Guthrie tagged and scored on the play, tying the game at 2-2. Morrison then hit a one-out single, but Reilly Jr. retired Dinger for the second out of the inning, maintaining the tie. Reilly Jr. grounded out for the first out in the top of the fourth, and after Tom singled, Guthrie retired Reilly to end the inning. Cookies & Cream got back to work in the bottom of the fourth. Reilly Jr. retired Guthrie for the first out, but the next batter, Joey, hit a solo blast to left, putting Cookies & Cream ahead 3-2. Morrison then came to the plate and crushed a solo shot, and the back-to-back homers gave Cookies & Cream a two-run lead at 4-2. Dinger followed with a single, and moved to third when Guthrie hit a one-out double. It looked as if Cookies would blow the game open, but Reilly Jr. retired the next batter, Joey, stranding two runners in scoring position and keeping the deficit at only two runs. Guthrie retired Reilly Jr. for the first out of the inning, and Tom followed with a single. The next batter, Reilly, doubled off the wall, scoring Tom from first, cutting the score to 4-3. With one out and a runner on second, Reilly Jr. grounded out to left for the second out of the inning, stranding the runner. Cookies & Cream were unable to add to their one-run lead in the bottom of the fifth, as Reilly Jr. retired the side in order. With the score 4-3, Cookies & Cream turned to their bullpen, bringing their closer Morrison in to lock down the save. Tom led off the top of the sixth with a double, putting the tying run on second. The next batter, Reilly grounded out to left, but advanced Tom to third on the play. With one out and the tying run only a base away, Reilly Jr. hit a sharply hit ball to left, but Cookies & Cream were able to field it for the second out, ending the game and giving them a 4-3 win. The win moved Cookies & Cream to 12-7 on the season, while Questionable Outfit sat a half game above them in the standings at 13-7. – Guthrie pitched 5 innings in the winning effort for Cookies & Cream, allowing 3 runs on 5 hits. Morrison pitched 1 inning for the save, allowing no runs on 1 hit. 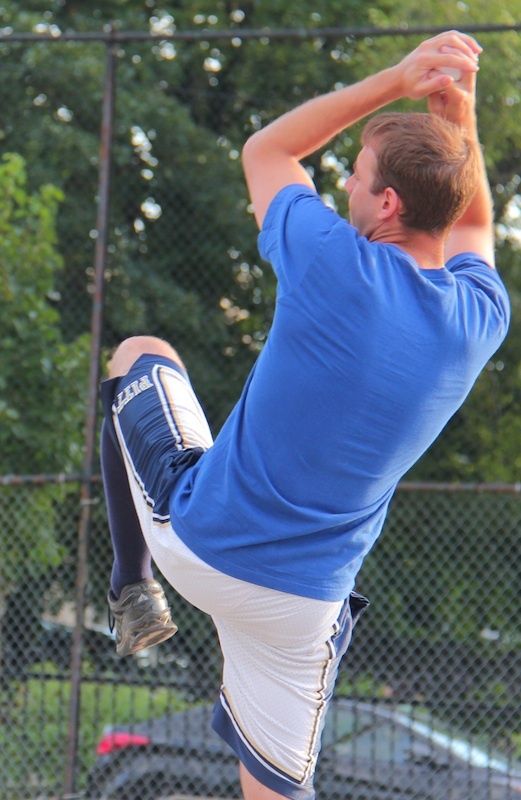 – Reilly Jr. was saddled with the loss for Questionable Outfit, giving up 4 runs on 11 hits in 5 innings pitched. – Morrison led Cookies & Cream on offense, going 3-for-5 with 2 singles, a home run, a run scored, and an RBI. – Dinger and Guthrie each contributed 3 hits for Cookies & Cream. 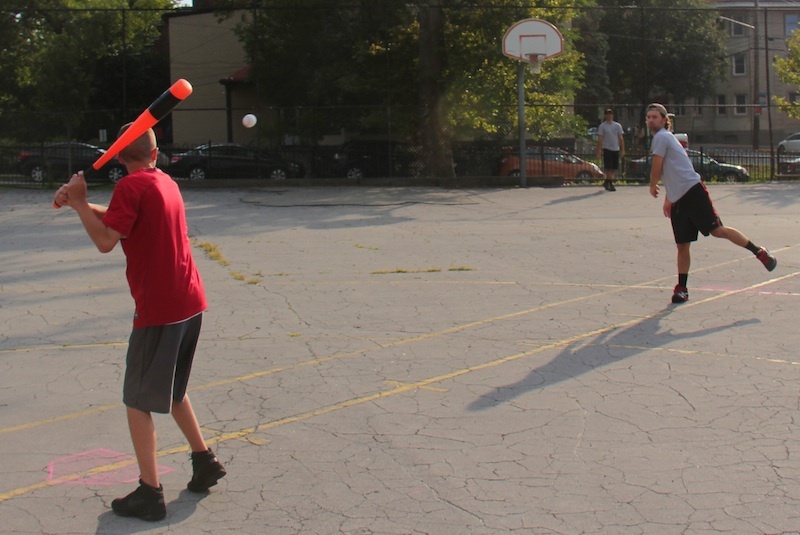 – Tom led Questionable Outfit at the plate, going 4-for-6 with 3 singles, a double, and 2 runs scored.